The Swedish Anarcho-syndicalist Youth Federation is celebrating its 20 years of its existance, and you are invited! In the early 90's, the political, social and economic map of the world was destined to be changed forever, and there was no guarantee if reaction or progress would fill the power vacuum. The Soviet bloc was on the brink of collapse. In Sweden, a new generation of white supremacists, extreme rightists and nazis took to the streets to do the bidding of the masters of the new world order. As a consequence of the increasingly unregulated internationalized flows of capital, ever-more severe regional and global economic crisis started pounding the dispossessed of this world. It was obvious that even that which had seemed like a "perfect" Scandinavian middle-way started to give way; the hegemony of the Social democrat leadership which had been more or or less constantly in power in Sweden post-WWII was crumbling. The formation of many local clubs of anarcho-syndicalist youths in different cities in Sweden became the spontaneous response to these new economic and political realities. An increasingly violent reactionary racist movement begun to gain traction as unemployment, privatization and industrial displacement came to the fore, and a new kind of Class War was gearing up again in the societes of the "perfect welfare states" in Scandinavia. Thus, it was obvious that things would never be the same, and for young people in Sweden, the old ideals fo anarcho-syndicalist direct action seemed more relevant than ever before. 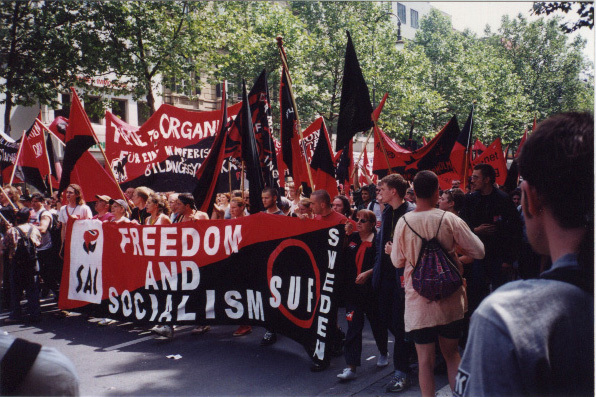 This is why, in 1993, the SUF, the Swedish Anarcho--syndicalist Youth Federation, was reconstituted in its modern form formed when youths from Joe Hill's old hometown of Gävle, the non-marxist radical youth in the university city of Uppsala and libertarian youngsters from the island of Gotland met up in Uppsala and decided to join forces. In just a few years, it had become obvious for politicians, union fat-cats and the average joe on the street that this new SUF was a poltiical force be reckoned with, as it soon became one of the fastest growing extra-parliamentary youth movements in Sweden, with a magazine of it's own called - Direkt Aktion, still published today. It set the tone for tactics and outlook on the neo-liberal policies of the IMF/WTO and other institutions during the surge of the globalization movement of the 90's (with 20-25 000 people partcipating in the protests against the EU summit in Gothenburg 2001). From these first three local groups a federation was formed which came to spread all over Sweden, encompassing 55 local groups at it's height, nowadays having a presence in about 30 cities, spread all over Sweden. As with many other libertarian youth groups, SUF became the "plant school" for thousands of activists who have since gone on to other progressive projects, strikingly often involved in the regeneration of the syndicalist union SAC, but also in campaigns like the No one is illegal-movement and radical union locals of all sorts. WIth campaigns such as planka.nu, inspired by autonomist ideas of the social factory and the social strike, the founding of Piratbyrån and the The Pirate Bay, and cooperating in networks with many other social movements, the SUF is still a strong force in Swedish politics, providing working class youth with an independent, self-organized and confident alternative to the stagnant ideas of statism and reformism espoused by the many different strands of stalinist, socialist and social democratic parties who still try to divide us young students, workers, and unemployed at the stage in history when precarity, increasing commercialization of our educational systems and all-to-simple racist explanations are threatening all the gains we've made over the last 100 years. This means that we belive it to be possible - and nessesary - to confront capitalism not only in the workplaces, but that this also must be done in schools, universities, local communities etc. This can be done in many ways and we respect and value a diversity of tactics. Thus, now young (as well as once young) syndicalists from over all over the world are now invited to Uppsala for the 20th anniversary of the founding of the modern SUF the 12th of October 2013 - the very same date as the "day of civil courage" which is celebrated each year in remembrance of the syndicalist warehouse worker Björn Söderberg, assassinated by nazis in 1999 for having revealed their plans to try to take over the social democrat union local at his workplace. There will be exhibitions, talks, old stories told, a gala dinner, live acts (amongst others the popular Swedish-Finnish hiphop/grime artists Max Peezay - winner of the P3 Gold Hiphop/Soul category in 2007), DJ:s, soccer tournament, and of course a manifestation in memory of Björn Söderberg and all victims of fascism world-wide. If you happen to be in Sweden, feel welcome to attend today - send a mail to sog@suf.cc for information on how to RVSP - 150 kr at the door, 100 kr early bird:). Please note that this is an alcohol and drug-free event. Valet är en illusion - vårat svar direkt aktion! Revolutionary greetings from metro Nu Yawk!